This HDMI over IP kit lets you extend an HDMI signal, as well as four USB peripheral device connections, over your network. 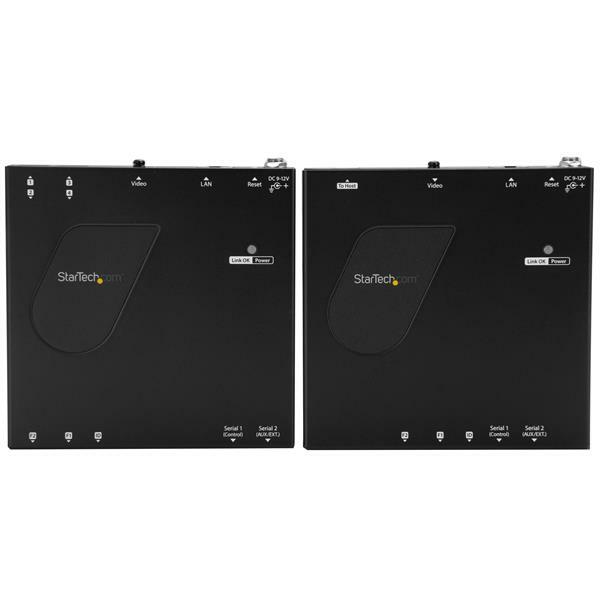 You can use additional receivers (sold separately) to distribute the HDMI and USB signals to multiple locations and combine your remote displays to create a video wall while using the USB connection to extend a touch screen to create an interactive digital signage presentation. • In a point-to-multipoint setup, you can connect the HDMI over IP kit through an unmanaged or managed Gigabit LAN portal. You can also connect one or several sources (transmitters) to multiple displays (receivers) over your network, using a managed Gigabit Ethernet switch with IGMP. 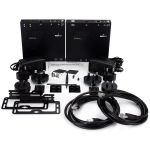 For further scalability, you can combine up to 16 different extender kits. 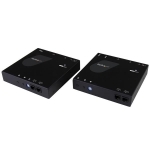 • For smaller-scale applications, you can use the extender kit as a point-to-point video extender by connecting the transmitter and receiver units directly over Cat5 or Cat6 cabling for a one-to-one HDMI extension up to 330 feet (100 meters). • HDMI distribution kit features an easy-to-use video control software app that helps you manage your IP video distribution. The app is simple to set up, with automatic hardware detection, and it lets you switch video sources for each remote display. You can also create and manage a video wall, for an impressive digital signage presentation that’s sure to catch your audience’s attention. • The software is available on iOS for your iPhone or iPad, Android for your smartphone or tablet, and Google Chrome browser. • The HDMI over IP extender kit includes optional mounting hardware for a tidy installation. Ideal for high-definition applications, the extender supports 1080p video resolutions and digital stereo audio. Plus, because the extender uses standard non-proprietary Cat5e or Cat6 Ethernet cable with RJ45 connectors, it eliminates both the expense and hassle of running specialized cables. 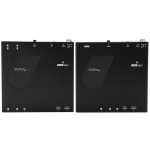 • The extender also features an EDID copy function, which ensures native resolution and maximum compatibility with your display or projector for a convenient plug-and-play installation.